2 Hockey games in one day with our Grandsons = awesome! Now we having just another busy day, still cold here with wind chill -23c (9.4F) but it is what it is. Bonus we have 2 hockey games today first one locally with Grandson number 4 in Plattsville at 9 am. So a few pics here below. Was a good game but they were defeated 7-2, such is life. Next home for lunch with Suzie visit with her Dad for a bit then I headed into Waterloo for a Suzie errand and she took her Dad to the Hospital in Kitchener to visit her mom. Then I am back to New Hamburg Rec complex, grandson number 1 playing a game here at 2:10 pm. It was well attended with 3 grandfathers, 2 grandmas and lotsa supporters. Now back home around 4 pm and Suzie heading back from the hospital in Kitchener. I fired up our Weber Q and grilled a wonderful Turkey breast ( got on sale) for supper. Then add a tasty salad we had another feast. That was our day, very busy and the real highlight for me was to watch the 2 hockey games, Suzie still wrapped up with her family. Another hockey game tomorrow as well ! Yep still cold, was -23C with the wind chill. That's like -9f. a bit of snow overnight. Out side first thing take out the garbage and recycle, neighbor across the road saw me shovelling a bit and called me over. They have her Dad's snow blower in their garage. Perfect I will come back later and pick it up. Off to Plattsville for a bit then pick up her Dad at 9am come to the house. He wants to pack more stuff. First time in about 50 years I have used a snow blower. Better than shovelling but still cold. After running here and there all day, (Plattsville,Kitchener, Punkeydoodles corners, New Hamburg and the retirement home. Stopped by our coach to drop off and pick up a few things. Just sunny and cold there too. Eventually Suzie got back home around 5 pm so I whipped up supper a very tasty Halibut fillet and a salad. Her Mom and Dad are slowly adjusting and are getting by somewhat, big changes for them. 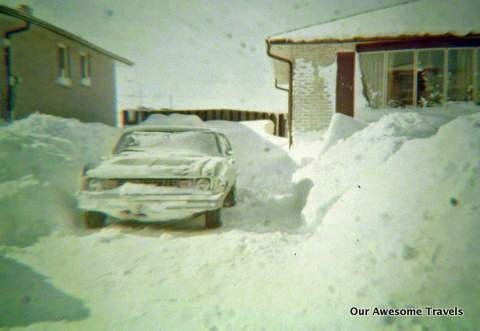 That was our fine winter day, sure could be a lot worse. Like colder, more snow and no snow blower or our own health issues. Thanks again for stopping on by, not much happening here for a while yet. Got some Grandson's hockey games on the weekend, thats exciting for me! Another day, not much I can say. Spring soon be here I think in about 52 days. Not much to say today, there is stuff I can't say but then the powers that be sayin nope. So there ya go. We doing fine, cold ya, snowing today ya, arthritis acting up, it don't like the cold damp weather. That's why we love southern Arizona. My back been aching for a couple days so Chiropractor visit in Waterloo this morning for a tune up. Make me feel almost brand new again! On the way back to New Hamburg snow fluffies starting, gonna get 3 to 7 cm (that's about 1-3 inches translated) Blowing, some white outs and yukky roads. But we Canadians here and can deal with this sh*t right? Don't have to like it but just deal with it. Now back here for lunch with Suzie, she helping her Dad do some stuff and I have a few more errands to run, remember I am the go-fer. Thats done, and gets a call from my honey not gonna be home for supper, busy family stuff and nothing I can do there to help. Just hold down the fort. Got more things accomplished and whipped up a nice supper for me. Tasty salad with red leaf lettuce, fresh mushrooms, cucumber, yellow pepper, black olives, dried cranberries, sunflower seeds, ground flax seed, grape tomatoes, bean salad, an apple, and some leftover chicken breast heated and chopped up topped with olive oil and balsamic vinegar dressing. Oh and some of my super hot sauce for the chicken! A few brown rice crackers with roasted garlic humus, had me a feast I'm tellin ya. Now blog posted and gonna actually maybe even get some reading done, (my KOBO misses me) it's been a few weeks since I have done that. And wait for my honey to come home. Thanks for stopping by again and hope ya'll enjoying some nice warmer weather in the south somewhere, want to see lotas pictures. Posted by George, a.k.a. "The Weber "Q" Man of Blogland" according to Rick Doyle. A few things here and there and trying to get things done. Just cold again last night -17C (1.4 F) but no problem we toasty warm. After my early morning trip to Plattsville back home pick up Suzie and off to Waterloo at 9 am. Our main stop is Conestoga Mall, need a new power supply for my 6 year old Mac book pro. While I did this Suzie over the the Source to pick up a Bell wifi device for her Dad's internet. My Mac good as new, Internet deal worked out very well and we back home for a bite for lunch. Few more errands, Suzie had a little snooze, (she burnt out) then after 1 pm over to her Mom and Dad's with his computer, printer and internet, and got that all set up. Now with the sun shinning was a good time to go grab our Satellite dish and set it up here, so that we can cancel the cable TV. We are paying for the dish anyway. And much prefer it over the cable. Now just fire up our Weber Q, grill a couple Turkey burgers and a salad, oh so tasty! Now supper done relax for a bit and a meeting with out financial adviser here at 8 pm. Get things all in place just so we don't run out of money. In the last 9 years he has been making more than we are spending and thats a real good thing. Glad you took the time to stop on by and really hope you had a wonderful day too. 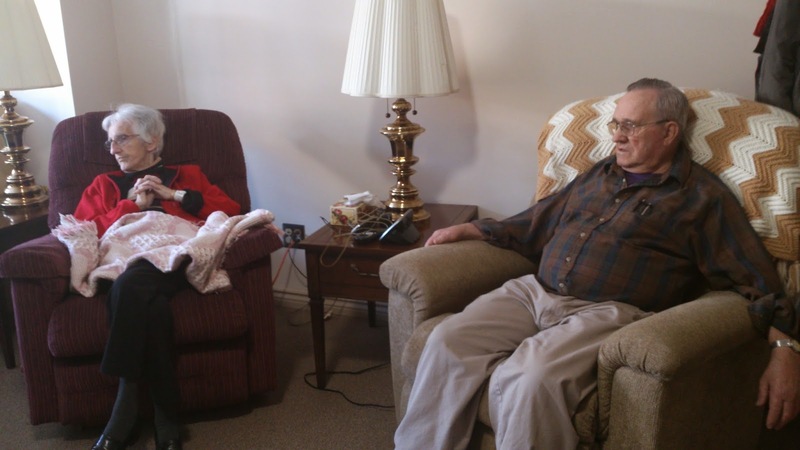 Today was the moving day for Suzie's Mom and Dad all went very well. Few minor glitches here and there, truck later than planned but no matter things came together. Got some help and just got it all done. All packed up here by noon and I whipped up some ham salad sandwiches for the crew, and had slow cooker full of homemade potato soup Suzie's Dad had made. And an apple pie we found in the freezer. Troops were fed and we carried on. Just after noon we arrived, un loaded the the truck and her Mom and Dad are now together again one happy couple! Suzie's mom's sister (Delores) the taking pics. Finally after a full day made it back to the house, Just the two of us. Wow its been a few weeks! We are done for the day gonna crash. Thanks again for taking a peak. Not much to say today other than we pretty well were busy all day. Sorting, packing cleaning etc... getting ready to move stuff tomorrow morning. Most of that done by noon so the three of us had a bowl of chicken rice soup her Dad had made and was in the freezer, we heated up in the slow cooker with a ham salad sandwich. Then Suzie took her Dad to the Stratford hospital to visit her mom for a bit and I got a few more chores done. No rest for the wicked, guess we must be pretty wicked. They head back here by 4:30 and I prepared supper. A hot chicken sandwich (leftover BBQ chicken from the other night), boiled taters, gravy and a salad fortified the troops. Getting cold here -6 F (-21c) thats kinda chilly but no snow until maybe Thursday. Thats good we doing the big move tomorrow morning to her Mom and Dad's new place. Ran a few more errands after supper, post this blog and call it a night, time to relax before a very busy day again tomorrow. Thanks for taking the time to stop in for a peek, glad to have you along. Hope you are warmer that we are here. Bloggerfest was a huge success, looking back at snow from years ago and another great hockey game! Well after reading some fellow bloggers postings, (you can check them out on our right sidebar). 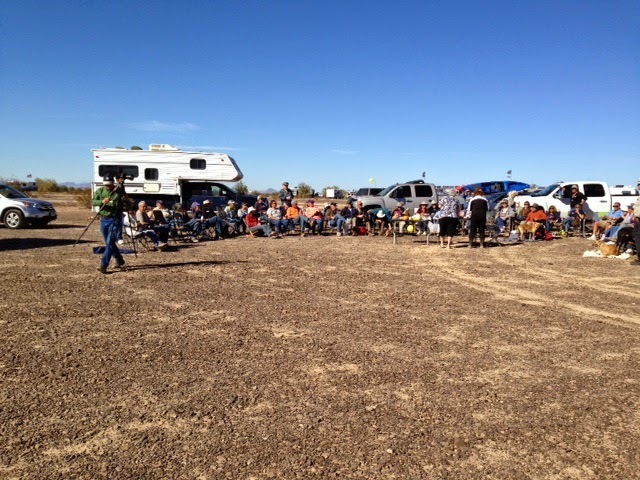 The Bloggerfest was a huge success in Quartzsite Arizona. So much thanks to Jeri of Just Wanderin and Sandi of Where are the Dixons today for putting this great event together. Sure wish we could have been there. Unofficial head count that I heard was 52 strangers got together and actually, met some blogger followers face to face, what and amazing time that would have been. This morning an early trip to Plattsville to chat with the guys for a bit at the garage, roads not too bad, centre bare and a bit of black ice but no rush. Sure beats the weather we used to get here years ago. Later today I was copying more slides for Suzie's Dad and come across these taken in the mid to late 1970's at the farm in New Hamburg. the laneway at the farm, Suzie her sister and ?? 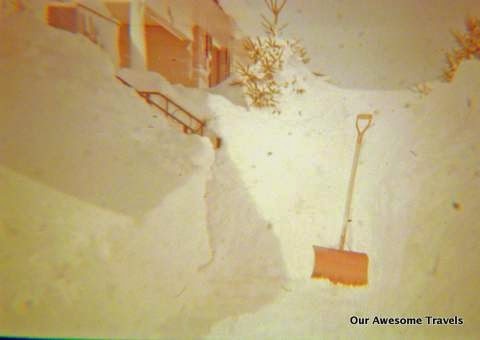 Then below is two of my slide from the same era at my house in Waterloo. Now back to today. After copying and editing another 60 slides I ran a few errands. And whipped up an easy one dish meal for supper. Pork chops and rice, Shake and Bake meal have not had for a very long time. For the recipe you can click here or check my recipe Blog, top right sidebar. Now just as supper was ready Suzie's Aunt and Uncle dropped in for a visit. No problem, we had lotsa salad and rice, and ham in the fridge, so just heated up a couple slices for them and we had a meal for the 5 of us. Now we just ate and ran to see Grandson number 4 play a hockey game in Plattsville at 6 pm and we wanted to be there. We were and enjoyed every minute of it. So much fun to watch these little guys out there playing their hearts out and having a great time. The game was good but they were defeated 5 to 1, but at least they had fun. Nice to see both Grandsons here at the arena my daughter and the rest of the family. That was a another good day, just plugging along, hope yours was a good one too. Nonstop day , busy and almost fun. No time to worry , just doit.. Not even too cold either. A milder day today, just below freezing and some sunshine here and there AND no snow. So really not too bad, only 8 more weeks until spring, we are not very patiently waiting . Now this morning at 9 am grandson number 4 had a hockey game in Plattsville but he was too sick to play, hope he gets well soon. But at 11 am grandson number 1 had a hockey game in Plattsville so we were there to cheer his team on. Then they we down to business. it was a very good fast moving game and ended up tied 3 to 3, Great hockey and the kids had fun too. Now back here for a bite for lunch and both Suzie and I set to work just organizing and cleaning up a few things for the move on Tuesday. Her Dad went to Stratford today on his own and had a nice visit. Now we missed the Blogger fest in Quartzsite Arizona but got an early picture via text from our friends Joe and Betty that were there for the day. Looks like they had a very good turnout and I am sure everyone there had a wonderful time, meeting new friends and finally meeting some virtual friends there that we have never met yet for over the years. Thanks Betty for the pic, I am sure we will have more to share with you guys at a later date. sure wish we were there. We Wanna say Hi to Ya'all! Now with more stuff done here her Dad call's as he is leaving the Hospital and I can begin supper. So found 4 bone in chicken breasts in the freezer, thawed them out, marinated for a couple hours and on to our Weber Q. And whipped up a tasty salad, some Swiss Chalet dipping sauce. When we were at the arena we could smell fresh french fries cooking, now that got a craving going for the two of us. So picked up a small bag of frozen fries to do in the oven, not ideal, but our fry daddy was not here and these are apparently much healthier, hhmmmmm??? Not too bad but they did take care of the craving. That was our day from 4 am until 9 pm it was nonstop. Hope all you Bloggers and Rv'ers enjoy the great weather there in Quartzite today. 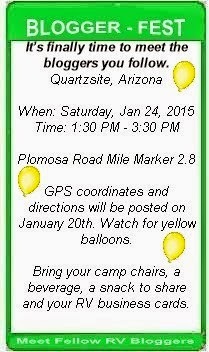 Blogger Fest this Saturday in Quartzsite Arizona, if you arearound drop on by, even if you are not a blogger. If you are in the area near Quartzite Arizona and want to have a fun couple of hours meeting some fellow Rv'er's and Bloggers this would be the place to go. Only 2 hours out of your day and guaranteed you will meet a lot of fun people. Just check out the information below, Jeri has pulled this together so beautifully. We were looking forward to this first time event but life kinda took us away at the last minute. Would be so nice to meet fellow rv'ers and bloggers that we have followed for many years and a lot we have never met in person. Hopefully next year, Quartzsite will always be there. I took the directions right form Jeri's posting on the Just Wanderin' Blog and copied them below. Directions: North on Hwy 95 from center of Quartzsite to Plomosa Rd. (about 5 1/2 miles) Right on Plomosa Road. Travel about 2.9 miles east on Plomosa Road to yellow balloons and to orange SKYTRAK on left side of road. Make left turn at SKYTRAK and follow dirt road immediately to the right. Now for my day nothing really exciting, but I am the designated Go-fer. Ya know go for this go this go for for that. I just do what needs to be done. Pack a few boxes here, wash some knick knacks, a couple trips to Stratford, pick up empty boxes, few things at the store, make lunches and whip up supper. House Husband, me thinks, but does keep me busy and my mind off of the warm southern climates. Chores done now I can have fun making supper. Grill some very tasty farmers sausage on our Weber Q, and a pan of sauerkraut. Added that to a tasty salad and pan fried potatoes for her Dad. Thanks again for stopping by and for those in Quartzsite, please take lotsa pictures so that we can feel like we were almost there. Busy day and made a snow bear for ya! A winter wonderland so pretty out here. Left turn at Slidell LA heading north. A wonderful start to a brand new year!